In Lake Como Grand tapestry we see the gorgeous view of the palatial pathway to the lake and mountains beyond. Lake Como in the Lombardy region of Italy has been a place of retreat and rejuvenation of royalty, writers, and artists since the Roman era. With the beauty of the region, it is no wonder why. We see the cobblestone terrace with vine and flower filled columns, elaborate gardens and the eye being led to the beautiful mountain ranges in the distance. It is literally a visual haven for anyone viewing this scene and this tapestry shows this wonderfully and will add beauty to any room. Lago di Como is a “Y” shaped lake near the small towns of Bellagio, Menaggio and Lierna, all places full of their own famous beauty. The Mediterranean climate and the natural beauty is a haven for uplifting the mind and soul for centuries, and the traditional architecture blends wonderfully with the countryside landscape. In this piece, a special ornate, rose filled border echoes the flowers in the scene and completes the work. 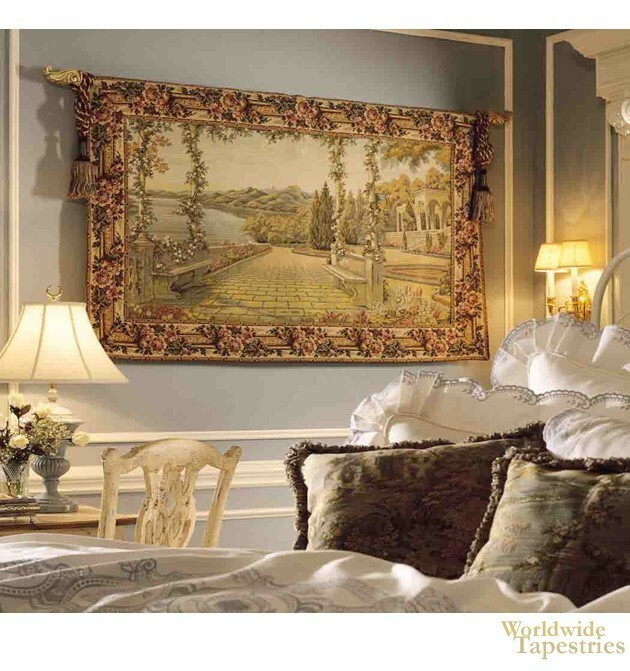 This Lake Como Grand tapestry is lined and has a tunnel for easy hanging. Note: tapestry rods, tassels and accessories, if pictured, are purchased separately. Dimensions: W 59" x H 38"